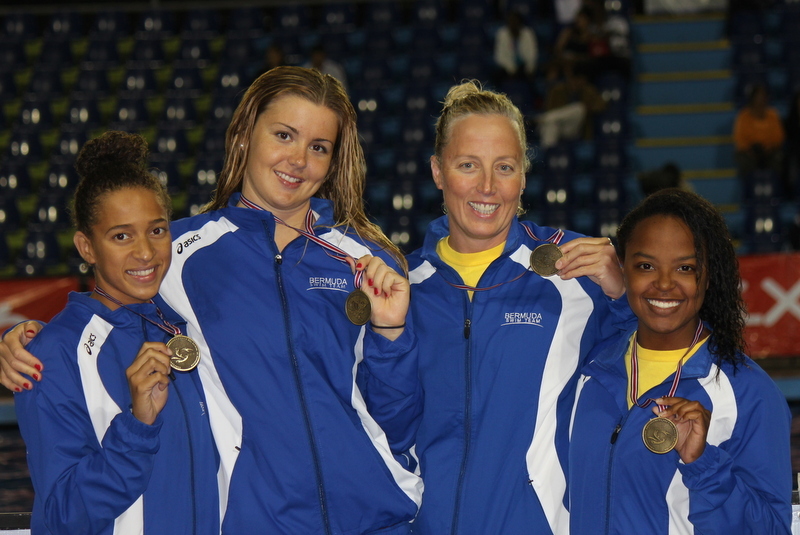 Bermuda swimmers continue to excel at the 2013 Central American and Caribbean Amateur Swimming Championships in Costa Rica, with Lisa Blackburn winning yet another gold, Rebecca Sharpe claiming bronze, and our relay team winning a gold medal in record setting style. Bermuda’s women’s 4×100 medley relay — consisting of Rebecca Sharpe, Lisa Blackburn, Rebecca Heyliger and Ashley Yearwood — won the gold medal and set a new national record when they finished with a time of 4:32. National Swimming Coach Ben Smith said: “The morning session of Day #4 started with the 400 free and both Stephanie Myles and Andrew Beveridge will be in the 18 & over girls and boys finals. “After rain, thunder and lightning delayed the start of the meet for a short time we started with the 400 freestyle. Stephanie swam a good 400 and finished in 4th place and Andrew was up next finishing in 5th place. “Lisa had another shot at a medal in the 50 breast and once again came through with flying colors as she won the gold! The 200 backstroke saw us have Rebecca Heyliger and Rebecca Sharpe in the final. “Last up was our women’s 4×100 medley relay and I had doubts of how they could perform. The two Rebecca’s had just jumped out of the 200 back while Lisa and Ashley were bothered by shoulder pain. Rebecca Sharpe finished the back in third place handing over to Lisa Blackburn in the breaststroke. “Lisa caught the leader and finished just ahead before Rebecca Heyliger dove in with a spirited first 50 fly. On the last 25 she tired a bit and the lead shrunk before handing over to Ashley Yearwood to bring us home with the freestyle. Bermuda’s medal tally is now up to ten, with Lisa Blackburn leading the way with five medals. What a superb performance by our swimmers, and especially Lisa Blackburm who must rank as one of the best in the world in her age group and a great inspiration to her fellow team members. Will the same team be performing in the Small Island Games being held here in Bermuda later this month? If so, what a great opportunity for us to pack the new swimming facility at the National Stadium to cheer on our wonderful swimmers. Congratulations to our superb swimmers, i will be going to see them if they are at the games which i am sure they are. Baffled by the lack of comments from all the bloggers online, c’mon folks this is something super possitive and needs some comments. You are sure quick to comment on the negative things.